DO you want to learn to improve your casting skills, well you are looking in the right place. This year we have a great group of Certified Casting Instructures willing to help!!! The cast seminars were all taught my FFI Certified Casting Instructors. In addition Washington State Council offered Continuing Education Seminar for Certified Casting Instructors. This is a great video!!!!! Note: All students for casting classes should bring eye protection to wear during the lesson. Eyeglasses, sunglasses, or safety glasses will work. Sunscreen is highly recommended. Dress for the weather outside. It is anticipated that students will bring the equipment they fish with including a balanced rod and reel. There will be some rods for people just beginning or without one. On the water classes require you bring waders and a rod if required. Spey classes require you to bring a Double Hand Rod with reel and balanced floating line. Bill Wheeler, MCI, will be kicking up your casiting game. Most people think of Spey casting with a two handed rod, but it is a very efficient technique for single handed rods also. Spey casting provides the most efficient way to make a change of direction cast. If you can roll cast, you can easily do many of the single handed spey casts. We will learn the Snap C and Double Spey to start and then add Snake Roll and if time permits, even the single spey. Dress for the weather, this will be on the water so wear waders, hip waders or wet wade. Eye protection is required and standard sunglasses or glasses are sufficient. Bring a single handed rod of at least 5 wt, a floating line, stout leader (0X or 1X) of about 10 feet, a yard fly (polypropylene is best as it does not absorb water-don’t bring wool yarn) and floatant. Robert Gerlach, Ci, brings you The Roll Cast, gateway to a whole new world of Casting. Join Robert Gerlach as we discover a whole new world of casts by improving our Roll Cast! All Spey casts culminate with the Roll Cast. Equipment; Your favorite Rod with floating line, safety glasses, hat, dress appropriately for the weather and a desire to improve your Roll Cast. Thomas Cammarata, CI, will help those entering the sport to get off on the right foot with a sound course in the basics. This class is designed for the person who has never picked up a fly rod before or the person with limited casting experience. We will start at the beginning and go through the fundamentals of the pickup and lay down cast (i.e., overhead cast) and false casting. If time permits, we will learn the roll cast just for the fun of it. If you cast is a little rusty or just need a quick tune up this class is for you. John Roskopf, CI,will teach flycasting basics from overhead casts to roll casts including how to shoot line. You will find I am patient, have a good sense of humor and a solid base of knowledge that will get you off on the right foot. It doesn’t matter if you don’t know anything about fly fishing as this can be an advantage because there will be no bad habits to correct! If you have some casting experience I can help you learn new fly casting techniques and can coach you in overcoming any self-taught bad casting habits that you may have picked up, enabling you to get the most from your future fly fishing opportunities. When you’ve completed this course, you’ll have gained confidence and be ready to catch fish! Les Rosenthal, MCI, will teach the “Thee Most Elegant Skill in Fly Casting, the Double Haul”. Emphasizing the fundamental skills of straight line path, smooth acceleration. appropriate casting arc, proper pause and eliminating slack this class correct any missing fundamental skills leading to false casting, determining how much line you can carry, shooting line and then teach you how to learn and improve double haul skills. Certified casting instructors will be offering 30 minute private lessons at a very reduced rate to benefit the IFFF and the public. People may either preregister with an instructor by name on the web site or sign up for a class at the event on a space/instructor available basis at the casting desk…Back by popular demand as one of our most popular features last year. SPEY CLASSES WILL BE HELD OFF SITE WHILE WADING IN THE RIVER. BRING YOUR WADERS AND SPEY ROD, REEL, AND LINE WITH LEADER ATTACHED AND YARN TIED ON IN LEIU OF A FLY. WEAR EYE PROTECTION. Todd Somsel, MCI, THCI, CBOG will present an introduction to Spey casting by means of two distinct statements. First, think the cast through before you do it, not as you cast. Second, initiate and execute the entire Spey cast with the underhand. Roll Cast & Flip the Tip Detailed look at how to make a sweep type roll cast.Flipping the tip will make an effective forward cast by efficiently using the under hand. Lifts: Types of lifts and the importance of using the correct lift to make the cast more efficient. Anchors: The types of anchors, how and where it should to placed to take the full advantage of the Spey casts. Special attention will be paid to the Parallel rule and the consequences of not paying attention to it. Taking control of the anchor rather than letting the anchor take control of you. D-Loops: Types of D-Loops, when to use them and with which lines. Carl Zarelli, MCI, THCI, CBOG, APGAI says that If you have ever had an interest in the Certified Instructor test or just been curious about the test you will want to take advantage of this class. In this class we will review some of the written questions and most of the tasks in the test. Take advantage of an examiners insight from years of testing single hand candidates and the correct techniques and the errors that he has seen over the years . Download the test and bring the rod and line that you think is best for this exam. This class will be performed on grass. Jonathan Walter MCI is teaching: How the fly behaves once it has landed is a critical piece of fly fishing. Planning this starts before the cast is made and the execution must be thought out. This workshop will focus on straight line casts, aerial mends, and slack line planning as well as helpful adjustments one can make in the leader. Participants will learn about their most important asset that cannot be purchased in a fly shop! Thomas Cammarata, CI, will be helping you identify the next step to keep your casting in the groove and your fly going where you want it to. Jimmy Lemert, MCI, will up your casting game. If you enjoy fly casting and feel that you have reached a point where you feel comfortable with your cast and your loops, but would like to move forward with increasing line speed and distance, the double haul class is for you. This class will enable you to perform any existing cast and all future casts with more proficiency and will alleviate the amount of work you’re casting arm is doing. This class should be considered an intermediate level course, it is not for the beginning student. Chris Madison, CI, will listen to your concerns and help you make casting more pleasant and your day on the water more fun. In addition to being a certified casting instructor Chris is an active guide and helps fishermen many days on the water. Molly Semenik, MCI, CBOG, will teach this class focusing on the backcast loop. A good backcast loop always precedes a good forward loop! A good backcast loop can be directed to go up and over obstructions, or be presented to a fish. Good backcast loops improve fishing success! Don Simonson, MCI, CBOG, will teach each student where to focus to get that casting in line and the fly to the fish. John Roskopf, CI, will get you off on the right foot if you just getting going or want to check out what your friend told you about starting fly fishing. A good foundation builds a better skill set. Ruben Breitkreutz will help you learn to control your rod tip to help you present the fly to your target every time. 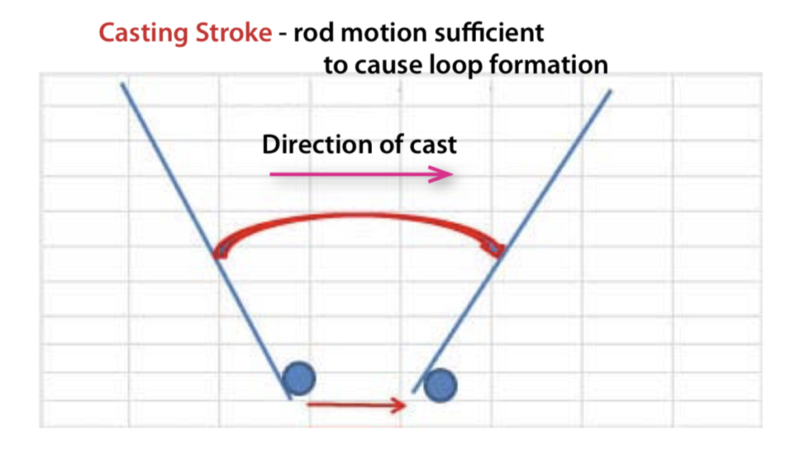 Moving your rod tip in Circles, Ovals and Lines will help you understand how to control you loop. Controlling your loop shape and size, helps deliver the fly to the fish. Please bring: 4-7wt rod with a floating line, 8 to 9ft leader and Eye protection. Pat Peterman, MCI, will help each student identify that thing that is holding back each student’s improving to the next step and we’ll fix it right there. The Fly Casting Skills Challenge Program is meant to be a fun, voluntary way to study, practice, and challenge oneself in a progressive fashion at one’s own pace. The program includes three different sets of casting skill challenges at the Bronze, Silver, and Gold levels with 7-8 casts at each level. It allows participants to measure there casting skill progress with an option of receiving documentation and recognition at each level. Each casting challenge at the Bronze, Silver, and Gold game levels is directly applicable to increasingly difficult fishing scenarios and includes false casts, roll casts, reach mends, slackline and curve casts, accuracy, and distance casts. Come learn more about it or, try out your skills at any one of the three levels. Bring your hip waders, eye protection and your favorite rod! Dress appropriately for the weather. Les Rosenthal teaches the penultimate casting skill, Distance Casting. Distance casting is the penultimate skill because so many casting skills occur sequentially in 1.5 seconds! The further the cast the bigger the effect fundamental variations create. This class will begin with the fundamentals, quickly progress to false casting, shooting line forward and back, double hauling, then teach you how to teach yourself skills to continue to improve your casting distance. Thomas Cammarata, CI, will help folks with one of the most fundamental but underused casts that is a staple with those fishers that catch fish. Join the group and broaden your skill set.